Find a Diabolo for hire near you in minutes! Option 1. Enter your event location below & contact a Diabolo directly! Option 2. Request multiple quotes from available Diabolo Get Quotes! Option 3. Read information & advice on hiring Diabolo Read Advice! 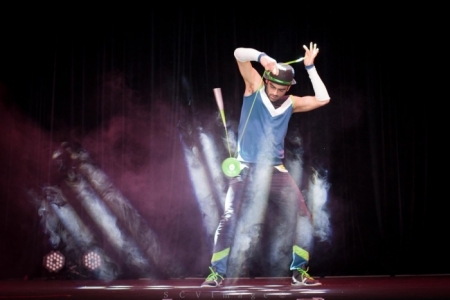 WANT TO KNOW MORE ABOUT Diabolo EntertainerS? Read on for the most comprehensive guide to booking Diabolo Entertainment, including how much Diabolo Entertainment costs, exactly what they will do at your event, plus tips, advice and information to help make your event one to remember! What exactly will a Diabolo Entertainer do at your event? Diabolo performance is a type of juggling which sees the performer balancing two cups with a string, which is attached to two sticks that the performer handles. The art of Diabolo is somewhere between juggling and yo yo’ing and is a captivating performance which can incorporate a vast amount of cups at any one time! A Diabolo Act can perform a range of tricks at your event such as a ‘Toss’, where the Diabolo is tossed in the air and caught by the Diabolist, a ‘Grind’, where the spinning Diabolo is balanced on one of the sticks, or an ‘Orbit’, which is where the Diabolo orbits around a body part! Diabolists are street performers and can often be seen performing in places such as London’s famous Covent Garden. It has been recently made even more popular by professional Diabolo Acts performing on the ‘Got Talent’ television programme, which is shown all around the world! When you hire a Diabolo Act for your event, then you may get a solo Diabolo performer or a host of Diabolo performers who will have created a choreographed show! Mainly, a Diabolo Entertainer will delight you and your guests with a fantastic service which will put the wow factor into celebrations and impress everyone! What event types are Diabolo Entertainers hired for? Hire a Diabolo Act for your wedding evening drinks and you’ll get a talented street-entertainment act which will be thrilling for your guests! The hired Diabolist can bet set up to perform on the stage at your wedding venue where they will grip your wedding guests with their skills all the while performing to music. You can expect to see famous Diabolo tricks such as the ‘Sun’. This is where the Diabolo is swung around in a large circle around both sticks, which will end with two twists of string on top of the Diabolo! Or how about the ‘Coffer Grinder’, which is where the Diabolo is caught on the underside of the string, before the string is looped over one of the sticks. The Diabolo is then tossed many times by the stick. There are so many dazzling tricks that the Diabolist can perform that you will simply be bowled over! Search our directory for Diabolo Acts and you will find solo Diabolo Performers as well as group Diabolo Acts! A fantastic side act to your wedding evening drinks show! A Diabolo Act will be fantastic entertainment for your corporate event such as a trade show. Hire a Diabolist for your trade show and you will get an experienced street performer who will wow the clients and potential customers with amazing tricks such as the ‘Umbrella’, which is where the Diabolo is swung side to side over each stick, and the diabolo will form the look of an umbrella! The Diabolo Act can be stood on a stage at your trade show where they will dazzle the audience with other stunning tricks such as the ‘Elevator’. This is where the Diabolo climbs up the string! The Diabolist can perform to music of your choice and will be great in rounding up interest in your product, no matter what industry you are in! Are you booking acts for your product launch? Then why not hire a Diabolo performer to boost interest in your product?! The Diabolist is a self contained act which can be hired as a mix and mingle act and can therefore get right within the action, or, they can perform their array of tricks right next to your product stand! Due to the amount of skill involved, a Diabolo Act can appeal to people of all ages! We would highly recommend hiring a Diabolo entertainer for your product launch if your target age group is aimed at a younger crowd. If you are looking for entertainment for a Summer fate or a holiday camp, then we highly recommend hiring a Diabolo Act! The hired Diabolo Act can run through the greatest ever Diabolo tricks and will maybe even inspire some children to take up the pastime themselves! If you are looking for acts to perform at your circus themed party, then a Diabolo act will be ideal! The hired Diabolist can perform a variety of Diabolo styles such as the fairly new ‘Contact Diabolo’. This is where the Diabolo is thrown and caught by using different body parts. Ideal for a circus themed bash! How about hiring a Diabolo Act for the entertainment at your birthday party? The Diabolist can be set up to perform on the stage at your birthday party where they can show off their Diabolo skills along to the music of your choice, or they can alternatively be a walk around Diabolo Act, mingling with your family and friends! The Diabolo Act will perform fantastic skills such as a ‘Hyperloop’. This is where the diabolos orbit each other inside a closed loop or string! How about the famous ’Star Cradle’ move, where the strings are twisted into a star shaped pattern! If you are looking for captivating acts to entertain the children at a children’s birthday party, then you may want to hire a Diabolo Act to thrill the guests! The hired Diabolo Act will impress the children with a huge amount of tricks including spinning multiple diabolos at the same time! Hiring a Diabolist will most definitely inspire the children to take up the hobby themselves! How much do Diabolo Entertainers cost to hire? Our simple to use entertainment directory allows you to firstly search for the best Diabolo Entertainers who are local (or travel to your area) and then via the contact form you may contact them directly to enquire for a no obligation quote to perform at your event. Some acts will also add a rough price guide to their profile for your convenience. What are the usual set formats and performance lengths for Diabolo Entertainers? A Diabolo Entertainer can be very versatile when it comes to timescales at your event/function, wedding or party. The average time of a Diabolo Entertainer’s show will be about 45 minutes to 60 minutes. Each Diabolo Entertainer's performance times will change however. The easiest way to enquire about this is by using our simple-to-use messaging service here on the Entertainersworldwide.com website. How much space will a Diabolo Entertainer need at your event? 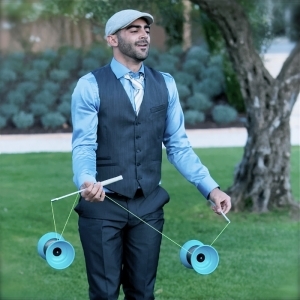 There are so many different types of Diabolo Entertainers out there that this will really depend on which performer you book. If you hire a solo Diabolo Entertainer, then they will need a stage area of at least 8’ X 4’. What equipment and set up requirements do Diabolo Entertainers need? Most Diabolo Entertainers will be self-sufficient and won’t need any set up requirements. If the venue is large, they may require a PA, and a microphone to perform at their best. What they will need will be basic info regarding the venue to help enhance their performance as much as possible. This can be anything from the stage size to the power supply. The main requirement of most Diabolo performance artists is darkness! This is something that will be discussed between yourselves and the Diabolo Entertainment Company ahead of the performance. It is standard practice for an Diabolo Entertainer to require a room where they can get changed and prepare their performance in private. Please check ahead with your venue to see if they a) have a backstage area, or b) a spare room in which the Diabolo Entertainer can set-up. How can you find and book a Diabolo Entertainer with Entertainersworldwide.com? WANT TO RECEIVE A RANGE OF QUOTES FROM Diabolo?